Someone the other day asked me why I used to use the little Don’t Panic guy as my avatar. For starters, the Hitchhikers Guide to the Galaxy is one of my all time favorite book series. In so identifying, many folks will immediately see it and perhaps gain perspective on my odd sense of humor. Or perhaps they will wonder what would make me panic? I don’t really know. However, once used, it seems to have stuck. In the beginning of our D/s relationship, I was overwhelmed by the sheer magnitude of the responsibility I was signing up for. For years, I had effectively conceded much of my family responsibility to my wife without ever even realizing it. I got complacent and lazy. She started filling in the gaps back then and I was content to let her. My own depression set in. I had no idea why I wasn’t happy. I am quite sure my abdicating the throne was the leading cause of her discontent and resentment. So she brings this new dynamic to the forefront in an effort to just be herself and perhaps find what we had lost in the marriage. This was a do or die situation for me. (and her as well) I was simply overwhelmed the first few weeks. She sensed that and expressed her concerns that I wasn’t up for the task or didn’t really want it. Quite the opposite, actually. As mentioned previously, this was tossing a life ring to a drowning man. I was in a rip current. I was starting to panic a bit. Then it hit me. 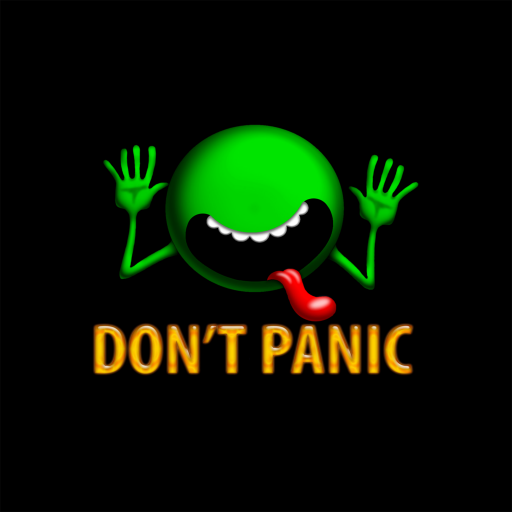 “Don’t Panic” The opening words to the Hitchhiker’s Guide to the Galaxy. Never had I identified with that book’s lead character more than in that instant. Thrown into the unknown with little more than my bathrobe and a towel. To new Dominants out there, I will echo the phrase from time to time. Simply Don’t Panic. As Dominant, you set the pace. Remember she wants this as much as you do. Together, you will figure it out. You will create your own path that works for the two of you. And, always remember, Don’t Panic.